These American designers, one an architect and the other an artist, were responsible for some of the most iconic modernist furniture design of the Twentieth Century. The combination of Charles' modernist principles and Ray's joyful aesthetic resulted in some of the best loved and used furniture designs. Born in St Louis, Missouri, Charles's early formal education as an architect was cut short, but not before his penchant for modernism had been formed. He started his own architectural practice before joining Eliel Saarinen’s practice in Michigan. Working with Eero Saarinen, Eames first designed prize-winning moulded plywood furniture for which he would later become famous. 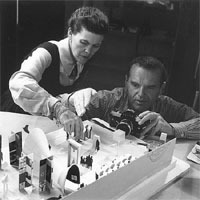 While in Michigan, Eames would study and then teach industrial design at the local Cranbrook Academy of Art. Ray-Bernice Kaiser was born in Sacramento and first gained attention as an abstract expressionist painter in 1930s New York City. In 1940 she studied at the Cranbrook Academy of Arts where she met and married Charles shortly after. After their marriage Charles and Ray moved to Los Angeles and began an extraordinarily fruitful collaboration that encompassed architecture, furniture design, and filmmaking. Ray would also produce textile designs. Their standout architectural design was their Eames House, built in only 4 days from prefabricated materials and a landmark in 20th Century architecture. Another notable feature of the Eames house was that Charles and Ray would live in it themselves until their deaths. In this respect alone, the house must rank as one of the most successful examples of modernist architecture. Their forays into modernist furniture design were equally notable. In the 1940 & 50s Charles and Ray revisited their earlier moulded plywood designs and produced the LCW (Lounge Chair Wood, 1946), the LCM (Lounge Chair Metal,1946), the DCW (Dining Chair Wood, 1946), the DCM (Dining Chair Metal, 1946) and the Eames Lounge Chair and Ottoman (1956). The ‘Plywood Group’ as these chairs collectively became known, was revolutionary not just because of their construction methods but also because they broke with the tradition of furniture being heavy, complex and upholstered. For these reasons the DCW in particular became popular as office chairs. In the later 1940s and early 1950s Charles and Ray created more classic designs, with the Eames ES 104 Executive office chair and its companion pieces the EA 117, 119, 217 and 219. There was also the Eames RAR rocking chair, the Eiffel group of dining chairs, and the La Chaise which used innovative materials such as fibreglass and helped cement the Eameses place amongst the preminent designers of the 20th Century.